The kitties have been named! 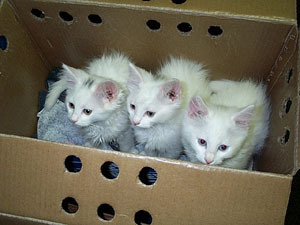 Meet Felix, Olie and BeBe! Read their story, see more pictures, and just generally see how cute they are! 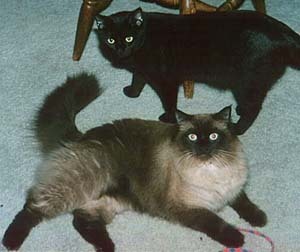 This is the dearly departed Beeze (fluffy) and his brother Domino (black). Both are missed. Beeze.com is owned (and sorely neglected) by Jon and Sarah. All intra-site content of this site is copyright (c) by Beeze.com. All rights reserved. All contented linked from other sites may be copyright (c) by their own respective owners. Acknowledgement of copyright will be given as known on a per-link basis - please email the admin if you believe your copyrighted content is being displayed without acknowledgement/permission.